Meet Shorty Rossi—Keynote Speaker, Pit Bull Rescuer/Activist, Motivational Speaker, Cigar Rights Activist, Little Person Talent Manager, Cigar Blender, Author, Producer, Wine Lover, World Traveler and Cigar Lover. For 6 seasons on Animal Planet, Shorty took his mission to television and became a public figure on the hit show Pit Boss where he was able to bring his cause and fight for the Pit Bull breed not only across the nation, but to the world. Now Shorty is a man on a mission: Shorty’s Freedom Trip 2018, where he journeys across the United States of America in his classic 1937 Chevy Master, speaking his mind on a few important topics. 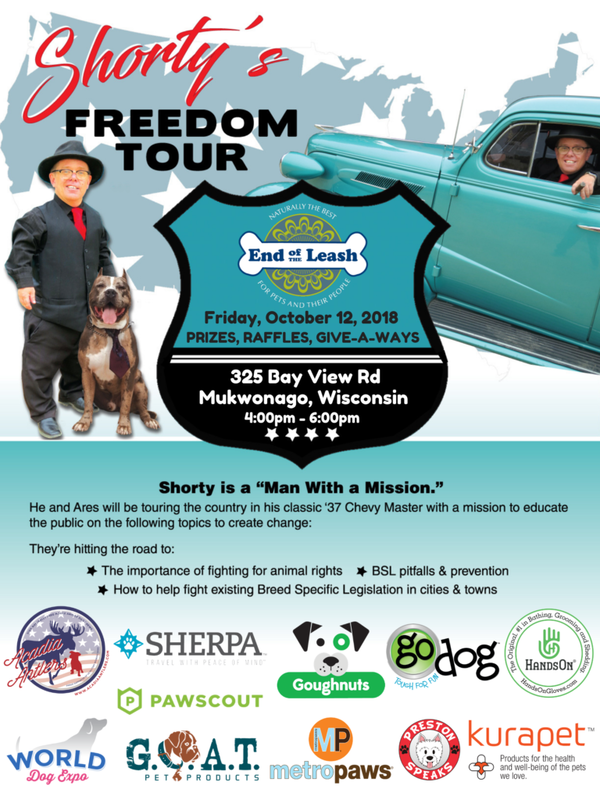 Shorty has been on tour for the past 8 years promoting breed awareness, fighting BSL (Breed Specific Legislation), fighting for animal rights, spay and neuter clinics, promoting his book Four Feet Tall and Rising, motivational and keynote speaking, and promoting his cigar line. His tour has already brought him to almost every state in the USA, all over Mexico, Guatemala, Nicaragua, Costa Rica, Panama, Peru and Argentina. Thanks to our friends at Winston's Wishes, he will be here in our Mukwonago store on October 12th, 2018, from 4-6pm! Watch our newsletter for more information. This is a screenshot of our Stay Connected section on our main website page. Not signed up for our newsletter? Just scroll down to the “Stay Connected” Section on our main website page and enter your email. That’s it! We promise no spam, and no sharing of any of your information, ever. Will we see you at Fromm PetFest this year? Join us at Henry Maier Festival Park, 200 N Harbor Dr, Milwaukee, Wisconsin on Saturday, September 22nd, 2018, from 10am-6pm. Free admission AND free parking! Learn more at http://petfestmke.com/. Mozzie is a 4-year-old Anatolian Shepherd Mix. He was surrendered because he was too much dog with two young children in the home. His adoptive home will have a huge snugglebug that seeks attention from people after he warms up to them!